The second annual K-State ‘Fighting for a Cure’ Shirt Day will be Sat., Oct. 17! Join first lady of K-State Football Sharon Snyder and the Snyder family, university president and first lady Kirk & Noel Schulz, and many other Wildcats as they unite in wearing their shirts to the home football game and everywhere in celebration of K-State cancer research and survivors as well as Breast Cancer Awareness Month. Get the shirt! The shirts are $20 and available at our center or shipped from our webstore sponsored by N Zone. They are also at Varney’s, which is donating $5 per shirt to our center and has raised more than $6,000! More details are on our Fighting for a Cure Shirt webpage. Spread the word! Post pics on social media of you and your friends wearing the shirt and use the #HelpKStateFightCancer hashtag! Thanks to everyone who bought shirts and wore them last Oct. 4! You helped raise $15,000 and lots of awareness to help K-State fight cancer! Check out our 2014 photo gallery! Tailgate with us! We also invite you to cheer on the ‘Cats with us Oct. 17 at our Tailgate Party in Cat Town! Follow the link for info. K-State kinesiology department research offers encouraging information for cancer patients: A brisk walk or a slow jog on a regular basis may be the key to improved cancer treatments. Our 6th annual Pink Power Luncheon will be Oct. 2. The guest presentation will be “Not Your Grandmother’s Mastectomy: Journey of a ‘Previvor'” by Jacque Groves, a local nurse who had a prophylactic (preventive) mastectomy after learning through genetic counseling that she had a high risk of developing breast cancer. This event is full, but you can get on the waiting list by emailing Marcia Locke at marcia@ksu.edu. The 18th annual Rob Regier Memorial Golf Tournament will be at 1 p.m., Oct. 16, at Colbert Hills. Registration opens at 11 a.m. Rob was a K-State graduate in pre-dentistry who passed away from cancer at age 26. The tournament is hosted by his family. Tailgate without the work! Come to our Tailgate Party in Cat Town Oct. 17. Wear your ‘Fighting for a Cure’ Shirt Sat., Oct. 17 to the home football game, or anywhere, in celebration of K-State cancer research and survivors as well as Breast Cancer Awareness Month! 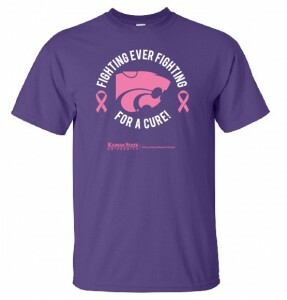 Proceeds from shirt sales support cancer research and education at K-State. 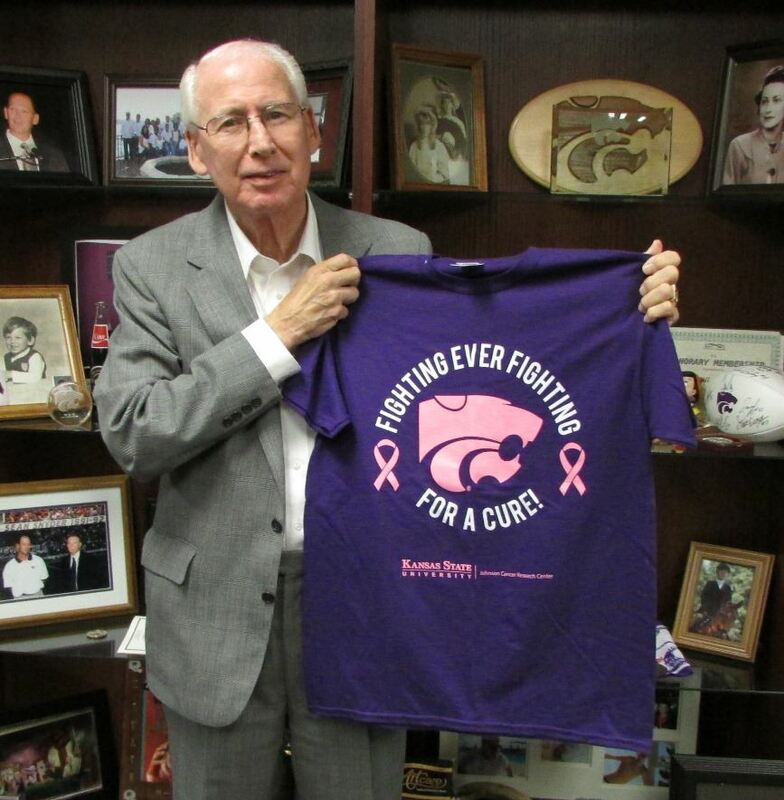 The Coach Bill Snyder & Sunny 102.5 Wildcat Challenge to Tackle Cancer takes place throughout football season. Other activities include our fall award application deadline of Oct. 1 and our Advisory Council meeting Oct. 9. Events are listed on our Upcoming Events webpage. 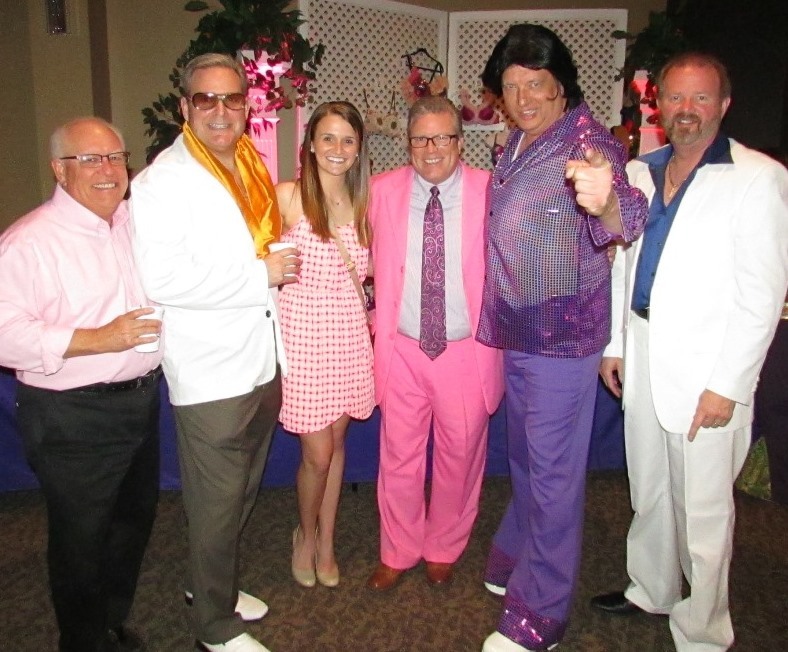 Polyester Party and Pink Rodeo raised almost $20,000! The party raised $13,120! We extend big thanks to the wonderful planning committee, party founder and emcee Dave Lewis, major sponsor CivicPlus and the other sponsors, and all the party-goers and other supporters. It was a truly unique and fun party! You can view photos on our Facebook. We think next year’s party will be even more dy-no-mite! It is tentatively set for Fri., April 15, 2016! 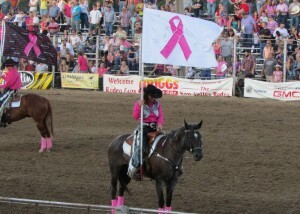 The 9th annual Tough Enough to Wear Pink Rodeo and Spaghetti Dinner raised $6,720 this year! 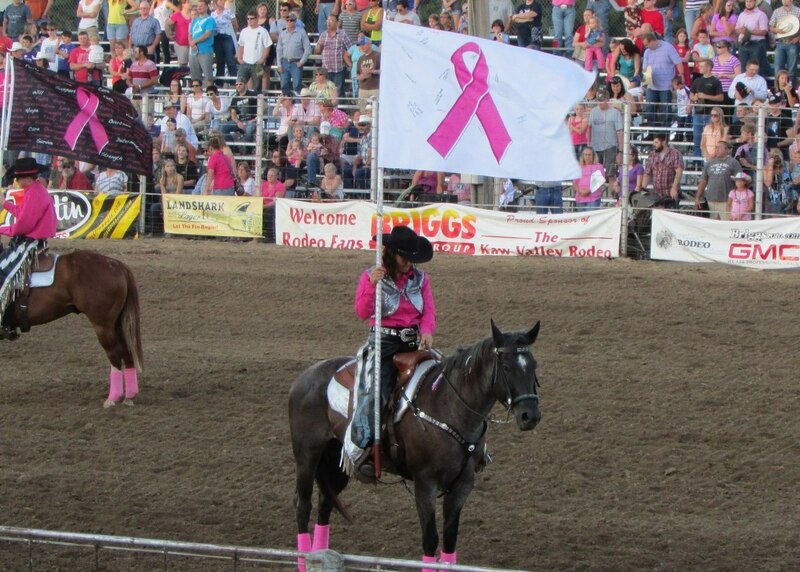 We thank the Kaw Valley Rodeo Association and its “pink committee,” as well as major sponsors Women’s Health Group and Cox Bros. BBQ, and all the other sponsors and event attendees! Our annual magazine, Conquest, went out late spring. 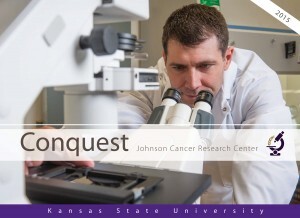 It showcases multidisciplinary cancer research being conducted by K-State faculty and students. 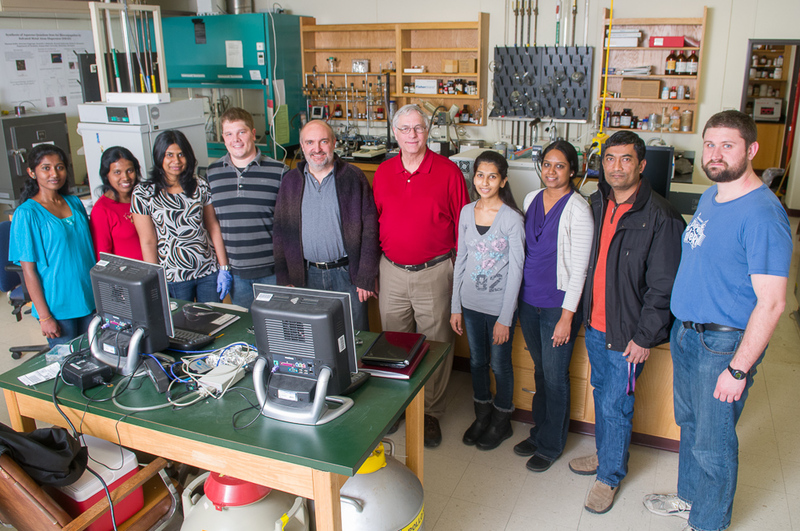 The 2015 Conquest features Drs. Brad Behnke, kinesiology; Susan Brown, biology; and Ric Rosenkranz, human nutrition; as well as K-State human nutrition alum Josh Umbehr, ’03; purple-bleeding retired Air Force Reserves Maj. Gen. Harvey McCarter, ’56; and Susan Whitaker, a young cancer survivor and graduate student in biochemistry and molecular biophysics.